If you have an H-1B visa to work in a specialized field like science, technology, engineering, or math and your employer is applying to be certified with the U.S. Department of Labor so that they can petition for your Green Card, then you might wonder whether you can change jobs during the labor certification process. Your employer applies to the U.S. Department of Labor for certification to show they first tried to fill your job with an American. They file the Form I-140, Immigrant Petition for Alien Worker, so that you can become a permanent resident of the U.S and get a Green Card. The employer has to file the I-140 Petition within the 365 days before the 6-year limit on your H-1B visa expires and within 180 days after the labor certification approval. If you change jobs before your employer’s labor certification application is approved, or after it’s approved while their petition for your Green Card is pending, your employer can continue the process as long as you’ll return to work for them once you get the Green Card. Though, if you leave the company they can stop the process. 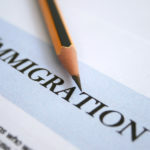 If your spouse has been admitted to the U.S. with an H-4 visa because of your job, they can apply for an Employment Authorization Document (EAD), a work permit. Your spouse can file Form I-765, Application for Employment Authorization Document along with proof that they were admitted to the U.S. on an H-4 basis because of your job and proof that your employer timely filed your labor certification application. Or, if your employer isn’t required to be certified or is already certified, your spouse can show that USCIS is deciding or approved the employer’s petition for your Green Card.